At the tail end of 2015 we met up with our DP Scott Baker and (second) 1st AC Felipe Borges to get the final shots for The Rift. Three inserts, two green-screen shots, and one exterior shot later, we were finished. 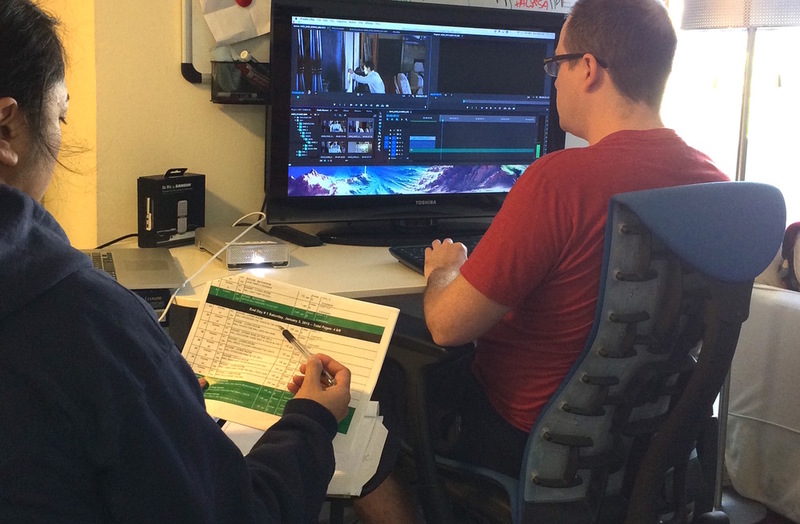 Now that we have all the footage we need, the editor is cutting it in so we can get to "picture lock." For those of you who are unaware, that's the stage in post-production where we are finished cutting the shots together. All the visuals are locked in place. After we have achieved picture lock -- any day now -- our sound and VFX people get to add their own magic. We'll post more updates about that as it happens. As for the posters, our artist is working on them along with his many other projects. I will let everyone know an ETA of the completed work as soon as I know. Until then, everyone, thank you again so much. We can't wait to show you this film! As the winter holidays approach, we are still hard at work pushing The Rift ever closer toward completion. First, a note about the posters. The process of designing and creating them has taken a little longer than anticipated, but I am hoping to have them printed before January. Fingers crossed. As with so many aspects of this film, we are going for quality over quantity. We will update you again about this later in December. Last week I had a spotting session with our composer, David C. Hëvvitt of AFX Industrial, for the film's score. That's basically a meeting where we talk about the music in the film and how it progresses through various important spots in the story. David is an extremely insightful musician and really understands how to enhance the story through music. His score is really going to bring out the emotion of every scene. On December 29th we are gathering a minimal crew to get our pickups, i.e. the last few little shots needed to complete the film. It'll be a short filming day, probably half a day or less. But these little shots we couldn't get during principle photography will make a huge difference in the final film. While we're working on this, I hope you are all enjoying the holiday season. As promised, here is the next installment of our behind-the-scenes videos for your viewing pleasure. Many super duper thanks and kudos to Karyn Laudisi, who not only worked as a PA on set but took numerous behind-the-scenes photos, and made all of these great BTS videos for us. She's a real gem. Please bear with us as we make our way steadily toward completion of the film and therefore all our remaining rewards that depend on that. It's only because of you that we have been able to make this film. In many ways it is exceeding our expectations, and we want to make sure we take the requisite time so it's something we can all be proud of. As always, we welcome any questions you might have. We hope everyone has had a great Halloween, and had some fun (and maybe candy) over the holiday weekend. It's been a while since our last update, but we want to let you know the status of the film. We've been working with our editor and have a cut we're happy with. In fact, we're not just happy with it -- we love it!! Post-production has been a fun (although sometimes very tedious) process, but when you finally see that movie come alive on screen it's all worthwhile. In the course of editing, however, we discovered that we need to get a few "pickups." That's filmmaking lingo for little shots we weren't able to get during principal photography, but which it turns out are critical to the film. You could call it "cinematic connective tissue." Sometimes in the editing room you find pieces that turned out better than you imagined, while other times you realize you need a little extra piece of the puzzle to complete the picture. For The Rift, we had a little of both. Having saved our pennies, it looks like we'll be setting aside a portion of one day in December to put together a minimal team and turn on the camera one more time. We hoped to finish the film in time for a Fall premiere this year, but ultimately we decided it's better to make everything the best we can first, even if that means taking a few extra months to put together another half-day of production. In the meantime, we have an artist here in Los Angeles working on our limited edition poster! Everyone who backed us at the limited edition poster level and above will be getting one of those delivered as soon as the artist finishes and we can pop them in the mail. I'll be posting a more accurate delivery date here in the very near future. In the next post, we'll have another behind-the-scenes video for you as well. Today, Alyssa and I watched a rough cut of the film. It was an exciting moment! There's still some work ahead in refining the edit, then visual effects, sound, music, and coloring -- but it's still quite a milestone. Director Jess Kreusler watches a rough cut of THE RIFT. The footage is cutting together really well, and the scenes are taking shape... thanks of course to the work of our wonderful cast and crew, AND thanks to our editor, Alec Styborski, who has worked on some things you might recognize like True Detective, Europa Report, Boardwalk Empire, Life of Pi, and the new-ish Netflix show Marco Polo. So, post-production is moving along. I wish it was moving a bit faster, but we are just taking the time we need to make sure the film is in the best shape it can be. We will be posting another update soon with some more behind-the-scenes footage for you, and keeping you abreast of what's happening with post-production. For now, we will be working with our editor, Alec, to keep refining the cut until it's ready for VFX and score. That's it for now, folks. I can't wait until we can show you the finished film! As you'll have noticed, we haven't posted an update for a while. The post-production process is longer than we'd prefer, of course, but we did want to assure you that editing is underway and we're moving toward completion -- slowly perhaps, but surely. There's an old saying in the movie biz: "Cheap, fast, good. Pick two." Well, we didn't pick fast! We're still on track, though, and working to prepare many of our rewards, such as the posters and stills from the film, which depend on post-production milestones like having the colorist complete work on the picture-locked film. We have also recruited a very talented composer to score The Rift, David C. Hëvvitt of AFX Industrial. Give his company a look! He's scored a ton of films and TV shows, and scored TV Spots for films like, most recently, CHAPPiE and Guardians of the Galaxy. He's extremely knowledgable about our genre, and a gentleman as well! Hello, Rifters! Today we have a teaser trailer for you. So without further ado, take your first peek at THE RIFT. What do you think? It's a very simple teaser, and we plan on releasing a slightly longer one in the weeks and months ahead. In the meantime, we're still working away in post-production. 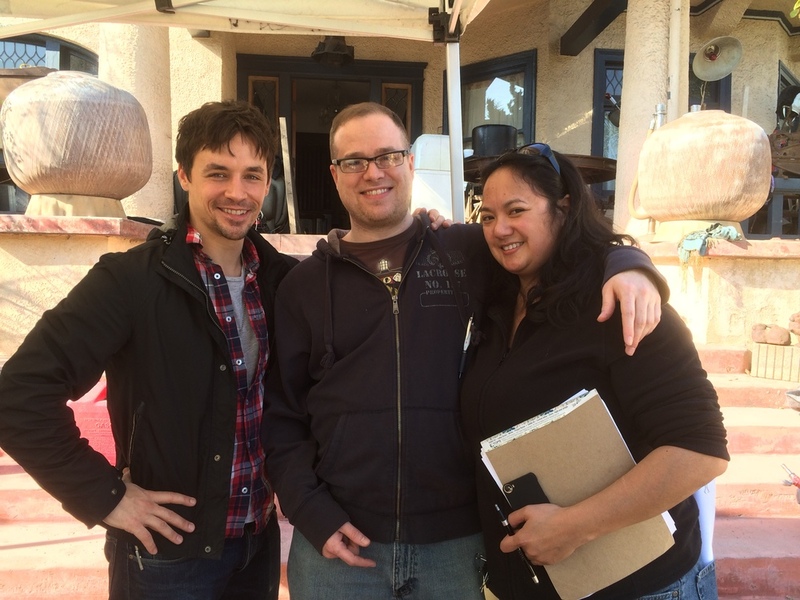 Now take a look at some more behind-the-scenes video from the set of The Rift. There's still a lot of work to do, but we will be posting some more behind-the-scenes photos and videos for you soon. Good news today: we now have an ad for The Rift in a comic book! Sadly, we had to submit the information for the ad before we had cast Rane Jameson as Will -- but as you know, he is our leading man! I'd recommend taking a gander at the comic itself, too, if you're into that sort of thing. It's called Psychosis, and is a new independent series by Adam Atkinson and David Coates. Good stuff! And, as promised, here's another little peek into the production of The Rift, straight from the director's mouth, for your viewing pleasure. This was for, as I may have mentioned, one of the most critical shots of the film... and it turned out great. I can't wait to show it to you. Speaking of which, we're still working on the teaser trailer -- so it's time to get back to it! Thanks to you and our wonderful cast & crew, we made it through production. It was an intense four days, from which we emerged with some new memories, new friends, and some fine-looking footage. And I can’t tell you how much both Alyssa (G.) and I learned from working on this film with such an experienced and positive team. We’re extremely grateful to you all. Really, there are no words for how much we appreciate all the support we’ve received, both moral and financial. Production is a very demanding experience, and there are always challenges, but it’s also extremely gratifying. We want to thank you all once again for helping us make this dream become a reality. Time really flew on set! After we finished production, a little rest was in order for everyone involved. We even threw a small cast party at a little place called The Local Peasant, where we got a chance to kick back and socialize a bit. Now for the post-production update: Right now we’re selecting a new editor, implementing sound design and VFX, then coloring. There won’t be a huge amount of VFX in the film, but there’s some – mostly for our Apparition. We have a VFX consultant, and a colorist lined up to finish things off before we head out to the film festival circuit. If you backed us at the Associate Producer level or above, your name should appear in the appropriate section on our page. We have a bunch more exclusive behind-the-scenes content to show you, too -- stills and video -- which we’ll be posting online starting this weekend. So check back with us soon! We've been working on the schedule, which has gone through a few evolutions. Alyssa G. works on the schedule. Old school style. One of our biggest pieces of news is that we've secured our location. It's an old, old Victorian house with a super creepy vibe. Perfect for a supernatural thriller! This past Saturday was a pretty big day for us. It all started with a fun FX makeup test. Elizabeth applied the FX makeup to my face because our actors were preparing for a photo shoot and we needed their faces free of blood... and such. We're not revealing any makeup effects until the film premieres, but rest assured -- Elizabeth is great at her job and this is going to be scary! Check out her website to get an idea of what she can do. Once I was made up, I enjoyed greeting our cast with a bloody, macabre smile as they arrived for the photo shoot. About the photo shoot... as you may know, our producer Alyssa G. is also a photographer. Weeks and weeks ago, we had ordered a green backdrop for her, so some of the photos she took could be composited against different backgrounds and other elements. Well... the shipment ended up not arriving on time, so I had to pull out the old green screen I made almost a decade ago and iron out all the kinks. The green screen ended up performing admirably, of course, as did our talented and photogenic cast. Therefore, the photo shoot was a big success. Rane and Danielle are total pros, and somehow they also kept us in stitches the entire time. Some of what we photographed will appear in our first poster, so that's exciting! And you'll get to see the poster here before it goes public online or in the press. After the photo shoot, though, our day wasn't over yet! We still had our table-read, where we sat down and read through the entire script out-loud. It helped us spot any final details that needed taken care of, and it was also the first time the cast got to go through all their lines together. Well, we definitely picked the right cast. We had a great time, and it was very exciting to hear everything Alyssa and I wrote being spoken out-loud for the first time. It was a long day, but a very productive one. There's plenty more to do, and we're working at it every single day. There will be more updates in the next few weeks as we close in on the end of Pre-Production and move ever-closer to principal photography at the beginning of January. So stay tuned, and wish us luck! We've been busy bees this week. The funds came through from Kickstarter, so armed with our new budget numbers, we finalized some paperwork and held a few production meetings with key crew members. Right away, it felt like we were on the same page. We followed up on previous conversations, shot a bunch of ideas back and forth, and Scott had great insights on some important visuals and how to obtain them. All in all, it was fun and very productive! The next meeting was with our fabulous Unit Production Manager & Line Producer, Alyssa Ulrich. Night of the Alyssas! What a pro, that Alyssa Ulrich. And such a pleasure to work with. Both of these ladies are super-organized and make my life as the director so much easier and less stressful. We covered a lot of ground, from budgeting to locations to finalizing our crew lineup... and more. There's still a lot of work to do, but after our meeting with Miz Ulrich it became clear how much we've already accomplished. A lot of what we're doing now is using our budget info to flesh out the rest of the team and lock down details with vendors. Otherwise we're starting the scheduling process for principal photography and waiting for reports to come in on potential locations and some other things. It's been a productive week. Tomorrow we have a few interviews with potential FX makeup artists and a possible Production Designer -- plus our super-secret mission... so stay tuned for more updates soon! Welcome to The Rift's Production Diary! Since the moment our Kickstarter campaign ended -- very successfully, thanks to you -- we've been moving full speed ahead with Pre-Production. We're working hard right now to secure the necessary locations where we'll shoot the film. Another big priority that we're working on is recruiting the remaining members of our crew. We have various production meetings every night this week and on Saturday we are not only meeting with some potential FX Makeup recruits, but we also embark on a mission to scout out some super-secret stuff that has to do with the mysterious crack (a.k.a. rift) that Will finds in the film. Stay tuned for more info. There will be plenty of updates, as well as behind-the-scenes photos/videos and more, as we finalize our team and move closer to production. And of course, we'll continue posting exclusive content throughout production and beyond! We want to thank you once again for helping us make this film happen. And... aw... look, you've made our director very happy. Please feel free to leave comment and questions on our Production Diary posts/updates. We'd love to hear from you and will do our best to immerse you in the process every step of the way!